Autodesk® Nastran®, an industry-recognized FEA solver, analyzes linear and nonlinear stress, dynamics, and heat transfer characteristics of structures and mechanical components. It allows real-time results and changes in solution parameters while solving analysis. This high-end simulation helps engineers and analysts to gain accurate results to complex simulation and is a part of Autodesk’s Digital Prototyping solutions. Composite analysis – Advanced composite capabilities include advanced failure theories, micromechanics-based failure, delamination initiation and propagation, sandwich failure modes, and layered composite output in all types of analysis including random vibration. Nonlinear analysis – Advanced nonlinear analysis capabilities include automated contact generation, contact algorithms, and advanced material models. Dynamic analysis – Advanced dynamic analysis capabilities include layered composite output in transient analysis and frequency response analysis, full random vibration fatigue analysis, DDAM, Craig-Bampton reduction, and efficient solving of large models. Additional analysis scalability – Autodesk Nastran provides ease of scalability using the existing Nastran model to access more third-party specialized analysis tools such as fatigue, optimization, acoustics, motion simulation, and more. An extensive verification program and documentation set using NAFEMS and other published benchmarks ensures precise solutions. Over 5000 test problems are verified for each software release to assure consistency, and numerous improvement updates unique to Autodesk Nastran that assure unprecedented precision. Real-time results are displayed through an integrated results processor, enabling users to visualize results, diagnose, and debug results as they are generated during the solution sequence. Built-in tools such as the trade study generator and parameter optimization give users quick insight into the effects of design changes. Advanced editing, context-sensitive input, and dynamic help greatly increase productivity and results reliability from the start. Real-time post-processing enables for viewing stresses, displacements, temperature and charting, automatic report generation, and animation. The resulting increase in productivity and reduction in model development time make the Autodesk Nastran Editor an indispensable tool for engineers and analysts alike. The ease of doing business becomes a valuable factor in empowering engineers and analysts to make great products. Autodesk Nastran offers a value-enhanced package of licensing models, product obtainability, and pricing. Want to learn more about simulation and analysis? 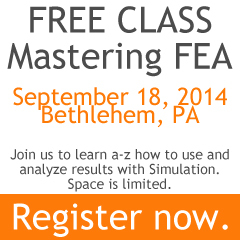 Join us in September for our free, one-day Mastering FEA class!